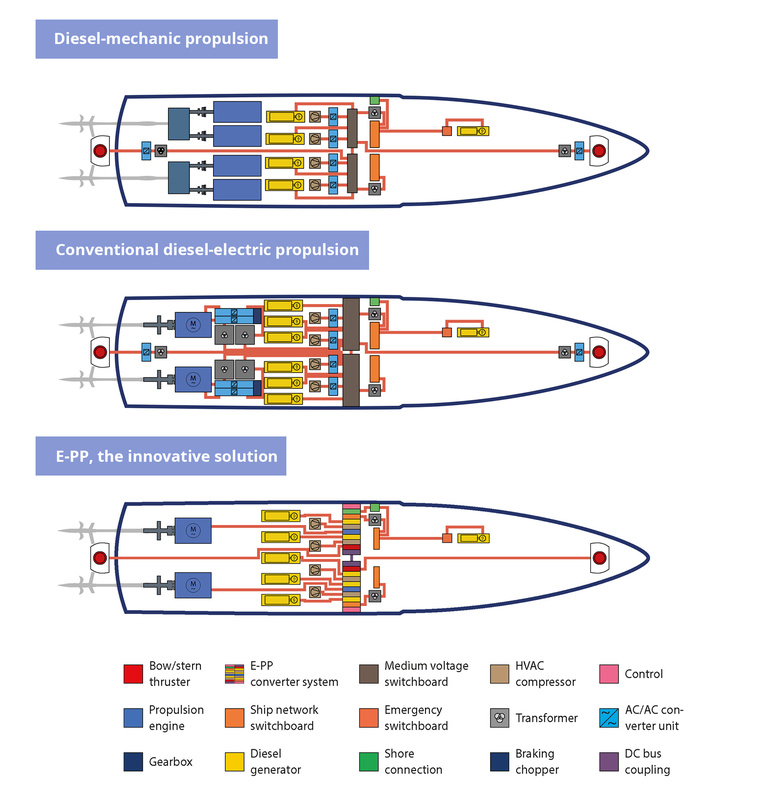 Top: Comparison between a conventional diesel-electric propulsion system and the E-PP. Bottom: The E-PP features a DC bus with a high degree of flexibility on both sides, for the electric power generation as well as for the consumers. Consistent usage of all E-PP features promises reduced fuel consumption in the order of up to 12 percent. E-PP – the electric power pack – is an innovative solution of onboard network and drive technology. It spans from power generation to power supply of all electrical equipment including all kinds of electric propulsion and drive systems. It is prepared for all types of internal combustion engines for power generation as there are diesel engines, otto gas engines and dual-fuel engines. For electric power generation, asynchronous alternators are used in combination with converters and a common DC bus. Synchronization is not necessary. Thus, the internal combustion engines can be operated any time at any speed with the best possible efficiency according to the power demands. Power is supplied to all consumers by corresponding IGBT converters with the required voltage and frequency. Running of the generating sets at an operating point of the combustion engines with an unacceptable low efficiency can reliably be avoided by introducing a start-stop function – well known from automotive applications. Thus, at part or low load, high savings of fuel are possible. The quality of electric power supply and propulsion systems determines the comfort on board to a very high degree. A comparison of the E-PP against conventional systems on the example of mega yachts shows the advantages of the solution developed by E-MS. If a high-powered sophisticated yacht shall be equipped with a conventional diesel-mechanic propulsion system, because of the limited space high-speed diesel engines must be chosen. Depending on their output two or more engines will be needed. However, in every case gearboxes and clutches are necessary for transmission of the power to the propellers. Contrary to both following systems this solution needs more space for the exhaust ducting of the diesel engines. If a diesel-electric power plant is preferred gearboxes are no longer needed but the space requirements are about the same compared with the diesel-mechanic solution. The reason: Spacious switchboards including the synchronization equipment, numerous transformers and converters for speed-controlled electric drives are necessary. These components require a complex control and automation system and a lot of cabling. 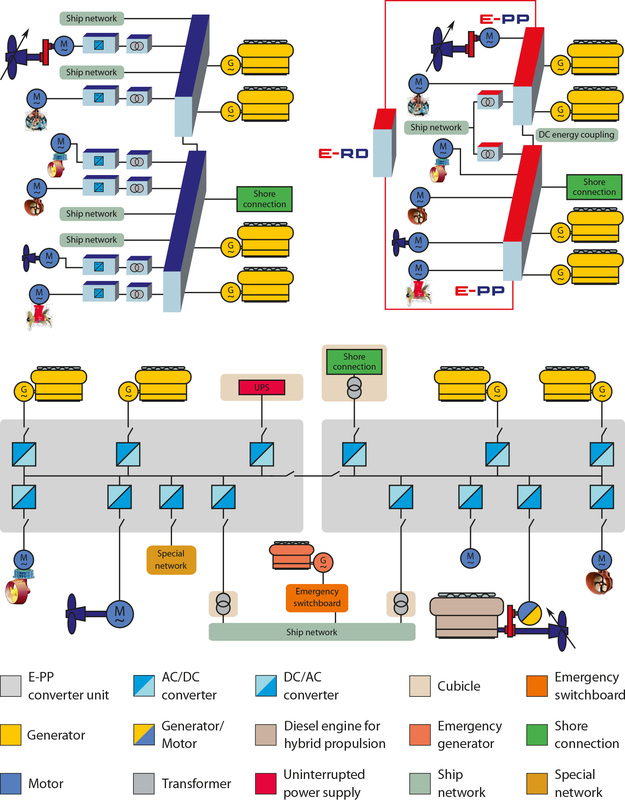 Contrary to conventional diesel-mechanic and diesel-electric systems, the E-PP developed by E-MS needs considerably less space and infrastructure, due to the fact that drive transformers are dispensable and switchboards for power distribution and converter units are combined and thus minimized. The E-PP consists of the said asynchronous generators, a comparatively small switchboard, advanced high-performance converters, a common DC bus and converters for power supply to the ship network and all electric drives. The control of the system is much faster compared with a conventional system as the generators can take over load within a few seconds, because there is no time needed for synchronizing them. This is a clear safety feature, even for extreme fluctuating loads. Due to the high integration of components, the automation system can be less complex, needing less cabling.